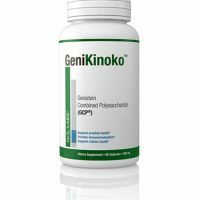 THE “ONLY” NATURAL WHOLE MOLECULE OF THYMIC PROTEIN AVAILABLE. PROTEIN THYMIC PROTEIN A (TPA) has been examined by the NIH and described as an immune modulator and anti-viral agent. Immunologist Terry Beardsley, Ph.D., is one of the world’s leading authorities on the thymus gland and it was Dr. Beardsley that discovered the existence of TPA. It has been scientifically proven that TPA is an essential substance; necessary for the proper functioning of the immune system, specifically the portion named "cell-mediated immunity" which controls how viruses, bacteria, and other harmful agents are controlled and disposed of by the immune system. 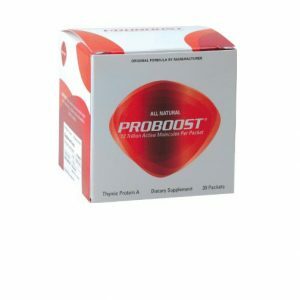 Each of the 12 trillion molecules (4 mcg) of TPA in a single packet of PROBOOST contains an important "transmitter" which seeks out the T-4 helper white blood cell and attaches to it to activate the cell. The T-4 helper cell is the "brain" of the immune system and controls critical infection-fighting cells such as the T-8 killer cells and T-8 suppressor cells, by secreting chemical messengers called cytokines, such as interleukin-2 and interferon. Scientific studies, performed on in vitro cells, animals, and humans, have all shown significant benefits in supporting and strengthening the immune system by activating the T-4 helper cells. 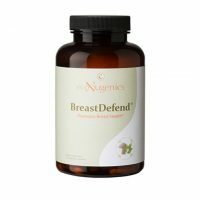 Reported results include reducing infections, improving sleep and energy. Each box of PROBOOST Thymic Protein A contains 30 packets (500 mg of powder). (12 PACKET ALSO AVAILABLE ON THIS SITE) Other ingredients: Maltodextrin. Suggested use: As a dietary supplement, empty one packet directly under tongue and allow it to dissolve for 3 minutes. Use 1-3 packets daily, as often as every 4 hours, or as directed by a health care practitioner. CALL PATRICIA OF PULSE NUTRITIONAL 1.800.783.9109, OPTION #2 REGARDING DOSING FOR YOUR SITUATION IF ADVICE IS NEEDED. Important: Allow contents to dissolve under tongue before swallowing, or protein will be inactivated by stomach contents. THE “ONLY” NATURAL WHOLE MOLECULE OF THYMIC PROTEIN AVAILABLE. 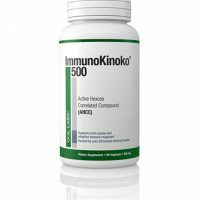 PROTEIN THYMIC PROTEIN A (TPA) has been examined by the NIH and described as an immune modulator and anti-viral agent. Immunologist Terry Beardsley, Ph.D., is one of the world’s leading authorities on the thymus gland and it was Dr. Beardsley that discovered the existence of TPA. 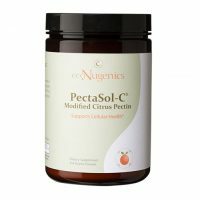 It has been scientifically proven that TPA is an essential substance; necessary for the proper functioning of the immune system, specifically the portion named "cell-mediated immunity" which controls how viruses, bacteria, and other harmful agents are controlled and disposed of by the immune system. Each of the 12 trillion molecules (4 mcg) of TPA in a single packet of PROBOOST contains an important "transmitter" which seeks out the T-4 helper white blood cell and attaches to it to activate the cell. The T-4 helper cell is the "brain" of the immune system and controls critical infection-fighting cells such as the T-8 killer cells and T-8 suppressor cells, by secreting chemical messengers called cytokines, such as interleukin-2 and interferon. Scientific studies, performed on in vitro cells, animals, and humans, have all shown significant benefits in supporting and strengthening the immune system by activating the T-4 helper cells. Reported results include reducing infections, improving sleep and energy. Each box of PROBOOST Thymic Protein A contains 12 packets (500 mg of powder). (24 PACKET ALSO AVAILABLE ON THIS SITE) Other ingredients: Maltodextrin. Suggested use: As a dietary supplement, empty one packet directly under tongue and allow it to dissolve for 3 minutes. Use 1-3 packets daily, as often as every 4 hours, or as directed by a health care practitioner. CALL PATRICIA OF PULSE NUTRITIONAL 1.800.783.9109, OPTION #2 REGARDING DOSING FOR YOUR SITUATION IF ADVICE IS NEEDED. Important: Allow contents to dissolve under tongue before swallowing, or protein will be inactivated by stomach contents.